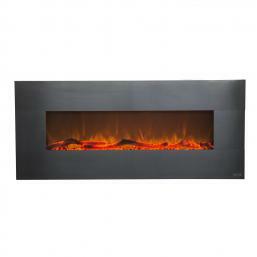 Our latest addition to the Touchstone Electric Fireplace family of wall-hanging fireplaces is the Chesmont 50 inch. The crisp white version has all the great features you've come to love about Touchstone electric fireplaces, like the modern hearth set, realistic flames, multiple heat settings and simple installation. The fully finished mantel makes the fireplace a great fit for kitchens and modern interiors. Includes Heat! High and low settings for different heat output (750W & 1500W) or use heat independently of the flame effect. 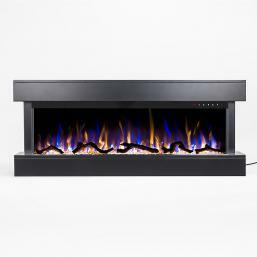 Touchstone's Chesmont 50" electric fireplace features a fully finished mantel design. Housed within the three-sided mantel is the industry's leading lifelike LED flame technology that is sure to complement the existing decor in your home. 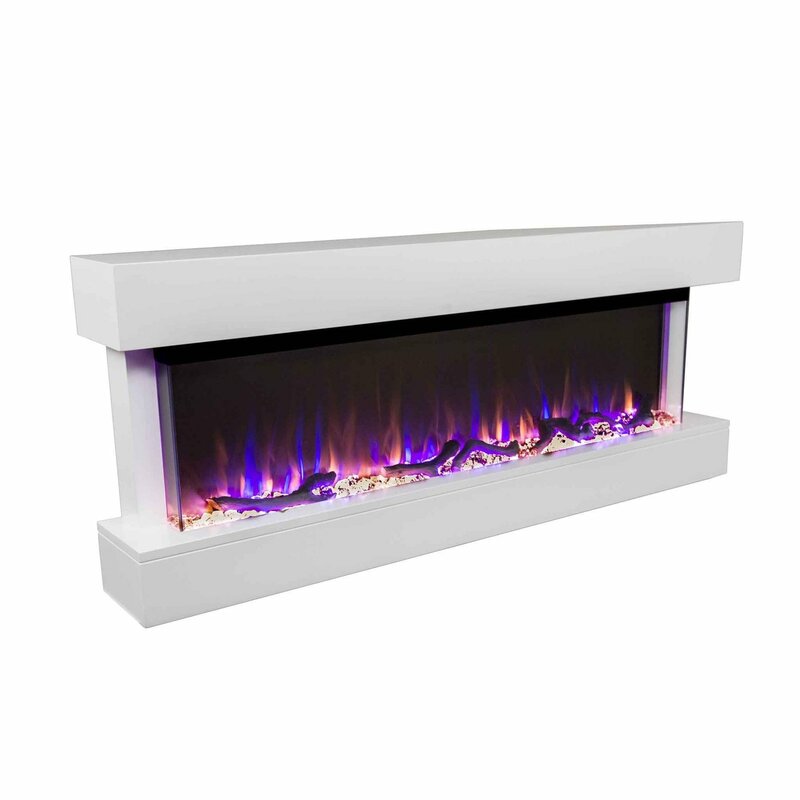 This 50" wide electric fireplace can be mounted on the wall of your bedroom, family room, or anywhere in your home to offer the aesthetic appeal of a finely crafted fireplace without the troubles and stress of an actual fire and is available in a crisp white or modern black look. The Chesmont electric fireplace ships with a driftwood and crystal hearth option. The combination driftwood and crystal hearth set brings a modern and sleek look to any living space. The Chesmont flames sit behind a tempered glass box that offers a three-sided view of the beautiful media and flames. The heating vent is located at the inside top of the mantel and in addition to its discreet location. The Chesmont also offers 5 flame brightness settings that are adjustable with the remote control or manually adjustable on the touchpad which is located on the face of the unit. The brightness options, which can be altered with the touch of a button, ranging from a dull ember glow to a full blaze. The Chesmont's flames are so realistic, your electric fireplace will be mistaken for a real gas fireplace. Offering both a high and low heat setting, the Chesmont can quickly add heat to a room up to 400 sq. ft. Please note the heater isn't designed to be the primary heat source in your room or home. It is designed to warm up an area on a cool evening, or bring the temperature of a room up a few degrees. You will find that the heat and style of your electric fireplace combined with your home's primary heating will offer just the right amount of warmth and ambiance for a cozy atmosphere. You can control your electric fireplaces heat setting by using the units remote control or by simply using the control options on the front face of the fireplace. The Chesmont also gives you the option of using the built-in timer to control the heat settings so that you have the ability to time the fireplaces heat duration for up to 7.5 hours. To create the cozy atmosphere of a traditional fireplace, this electronic unit emits authentic-looking flames that emulate a real fire. The flames that Touchstone Home Products™ fireplaces create are natural enough to have friends and family thinking that you own a traditional wood burning fireplace. Mounting your Chesmont fireplace to your wall is simple and it usually only takes one person to get the job done. Installation instructions are included with the unit and are clear and easy to understand. The Chesmont's easy mounting bracket is included and once it has been mounted on your wall, all you need to do is hang and secure your fireplace with the included screws. In many room settings, it is popular for customers to mount their Chesmont on the wall below their wall-mounted flat-screen television.